Sergeant Patrick Clark and Patrolman Michael Mullane, if nature favors them and they recover from their wounds received in the battle with fanatics Tuesday afternoon, are to be rewarded. That is the intention of the present police board. Only Mayor Thomas T. Crittenden, Jr., and Andrew E. Gallagher were present yesterday at the meeting. Commissioner Elliot H. Jones was at the funeral of Joseph Chick. The board had hardly convened when Mayor Crittenden announced that he wanted to say a few words regarding the bravery displayed by the police the previous day, some of which he and Commissioner Gallagher witnessed. "This board wants here and now to command the bravery displayed by its officers in the fight with religious fanatics yesterday," began the mayor. "The action of Sergeant Patrick Clark in going into the fight empty handed and the game fight put up by Patrolman Michael Mullane, both of whom were wounded, is to be especially commended. It is the intention of the board to reward these men in a befitting manner. The board, of course, deeply deplores the accidental shooting of the girl, Lulu Pratt, but under the circumstances it was unavoidable." The "befitting manner" spoken of can mean nothing but promotion. Patrick Clark went on the department September 12, 1888. On May 6, 1901, he was made acting sergeant and September 18 of the same year he was made a regular sergeant. Since his appointment he has served faithfully, not a black mark being made against him. During the life of the present board many promotions have been made, some of them men who had served but a few years on the department. Every time any promotions have been made, it was always believed that long service men would get prizes. "Pat" Clark's name was always spoken of in rumor as the one man who would certainly be rewarded. But he got nothing, the promotions going to men who evidently had more influence. The sergeant never turned a hand in his own favor and refused always to let his friends annoy the commissioners. Now that promotion is in sight for the brave officer who, unarmed, defended his brother officers, his friends all say that nothing short of a captaincy will do for him. His friends will not stand back any more, even at his request. Patrolman Michael Mullane went on the force November 16, 1905, as a probation officer, and on December 31, a year later, was made a regular patrolman. That might seem a short time upon which to base promotion, but there are men on the force who have not done one-tenth the service that Mullane did who wear sergeant's stripes. "Mullane has proved that he will stand under fire," everybody is saying, "and if he is not made a sergeant it will be nothing short of unjust." The board also took up the matter of allowing the city's streets to be used promiscuously by itinerant fanatics. An order was issued requiring the chief of police to personally handle this class of fakirs, and use his judgment regarding the issuance of a permit. Hereafter all new comers who attempt to use the streets to expound their peculiar religious teachings will be immediately arrested. Jack Gallagher, Democratic politician, former policeman and saloonist, assaulted Albert H. King, a reporter for The Journal, while the two were in friendly conversation in the street in front of police headquarters late yesterday afternoon. Frank Frost a reporter for the Kansas City Star, who Gallagher says was scheduled for a like assault, escaped the brute strength of the big saloonkeeper by rushing into the police station to call out officers to ave King. Gallagher was arrested, but immediately began a legal battle to gain his freedom. Milton J. Oldham, a lawyer hurried to the holdover from the police board rooms but his efforts to get the prisoner released were fruitless. Mr. King was taken to the emergency hospital, where the surgeons in attendance declined to examine him until the shock he had sustained had worn off. His injuries were later discovered to be serious, and John W. Hogan, an assistant prosecuting attorney, was called to take the injured man's statement. The assistant prosecutor at once placed a bar against the release of Gallagher by stating that he would prepare a serious charge against him, to be served immediately if political friends of the saloonist politician should succeed in getting the police department to accept a bond. Mr. King, who is a reporter for The Journal assigned to police duty, is still at the emergency hospital. He is not an able-bodied man because of injuries received in the Spanish-American war, and the attending physicians fear his injuries may prove permanent. Yesterday afternoon, Mr. King attended a meeting of the board of police commissioners The board had before it charges against Gallagher for selling liquor on Sunday at 8 East Fourth street, directly across the street from the entrance to Central police station, and operating a crap game at his other saloon, 310 Independence avenue. The charges regarding the last named place were postponed until the next meeting, but the board closed the Fourth street place. Milton J. Oldham, attorney for Gallagher, stated last night that the board promised him they would give Gallagher a chance and let his Independence avenue saloon run, but that the Sunday selling at 8 East Fourth street has been so flagrant a violation of the board's orders that the license would have to be forfeited. Gallagher and Mr. King have been acquaintances for some time, and, immediately after the court meeting Gallagher invited Mr. King to go across the street and take a drink before the police closed his place. Mr. King declined, stating that he was too busy at that time. On the stairs a few minutes later Gallagher again extended the invitation and again Mr. King, who was busy about his day's work, declined. In the press room on the main floor of the city hall Mr. King and Frank Frost, a reporter for the Kansas City Star, were discussing various orders made by the police board a few minutes later when Gallagher opened the door and with a smile, asked the two across to his place. "I guess we had better go," said Frost. "Cheer up," said Gallagher to Mr. King, and the latter reached for his cane and the three went into the street. Gallagher's place, the one soon to be closed by the board's order, made earlier in the afternoon, is immediately across Fourth street from the main entrance to the Central police station. It was there that Gallagher, growing reckless in his prosperity as a saloonkeeper, had openly sold liquor on Sundays until the place was raided by the police from the Walnut street station a week ago last Sunday. It was the evidence secured in this raid which the police board considered sufficient for revoking the license. As Mr. King, who, on account of former injuries, must carry a cane to steady himself, stepped from the curb into the street, Gallagher fell back a step between Mr. King and Mr. Frost. Just as they reached the center of the narrow street Gallagher took a hurried step forward and struck Mr. King in the forehead. The reporter fell to the pavement. "Jack Gallagher is killing King." Knowing Gallagher as a "bad" man, every police officer in the station was alert in an instant. Patrolman John J. Crane hurriedly took a pistol from the desk and Captain Walter Whitsett and Detective Inspector Charles Ryan, both shut off from the main lobby of the station, hurried to the door. Patrolman Joseph Welsh followed. In the meantime in the street Mr. King was at the mercy of the brutal saloonkeeper. Gallagher struck him again as he tried to get up , and then kicked him in the back. Mr. King rolled over, and the big saloonkeeper brought his heel down on the right side of the reporter's face, cutting a jagged wound across the face. As he kicked Mr. King in the ribs Patrolman Patrick Boyle grappled with him. He had reached the street ahead of Captian Whitsett, Inspector Ryan and Patrolman Crane, the latter being the only armed man in the crowd. Gallagher did not resist arrest, as the police had expected, and was led into the station door, but a few feet away, by Boyle, while Captain Whitsett, Inspector Ryan and newspaper reporters who had hurried from the press room at the head of the stairs, picked up the inured man Gallagher, was locked up, charged with investigation, and Mr.King was carried around the corner of the building to the emergency hospital. Upstairs in the police board rooms Commissioners A. E. Gallagher and Elliot H. Jones were just leaving their chairs. They heard the commotion in the central station below and went down to investigate. When they learned the circumstances of the assault, both commissioners became agitated. Commissioner Galagher went to the commanding officer's desk and admonished those in charge to hold Jack Gallagher, the saloonkeeper, unless a heavy bond was furnished. "I don't think he ought to be released uner any circumstances," said Commissioner Jones. The assault was considered unusually brutal by police officers and other witnesses, and the story soon reached the office of R. L. Gregory, acting mayor, Gus Pearson, city comptroller, and John Murray, formerly a newspaper reporter, saw the assault from the corner of Fourth and Main sterets as they were boarding a street car. They went at once to the emergency hospital and soon were joined by Mr. Gregory. The acting mayor asked Mr. King about the assault and then went at once to police headquarters, where he gave orders that Gallagher be held without bond. Mr. Gregory was closeted with Captain Walter Whitsett for several minutes and, when he emerged from the captain's office, assured those outside that the prisoner would be held for the customary twenty-four hours, when a charge must be placed against him. Assistant Prosecutor Hogan had taken Mr. Kin's statement by that time, and stated that if Gallagher's attorney saw fit to sue out a writ of habeas corpus he would have the prisoner held for the prosecutor. Mr. Hogan said he would call the assault to the attention of the grand jury this morning. Immediately after Attorney Oldham appeared, Jack Spillane and Patrick Larkin, the latter a Sixth ward politician, were called tot he station to furnish bond. When told that no bond would be accepted Oldham demanded that a charge be placed against Gallagher. He boasted that he would clear the saloonkeeper of any charge which would be brought Spillane, a sidewalk inspector for the city, was very angry when he found he not furnish a bond big enough to get his slugger friend out of the holdover. Thoroughly baffled, the trio later telephoned for a dinner to be served the prisoner and left the station. Mr. Oldham and Gallagher told him that he had intended to assault Frank Frost, the Kansas City STar reporter, who went into the street with him and Mr. King, but failed because the police got action too quickly for him. "He told me," said Mr. Oldham, "that King had double-crossed him and was responsible for his Fourth street pace being raided." Mr. King, who knew of the flagrant violation of the Sunday law by Gallagher, did not have anything to do with the raid. He had not written a line about the place for the paper which employs him and had told Tom Gallagher as much when the latter, a week ago, asked him why he was "sore at his brother Jack. "Jack is my friend," was the reply Mr. King made to Tom Gallagher. Previous to his career as a newspaper reporter Albert King had been an invalid for many months. He had received injuries in the Philippine islands while in the army and had wlaked on crutches a long time after being mustered out of the service. Mr. King was enlisted in the army here as a private in the Thirty-second United States infantry in July, 1899. He sailed for the Philippines in September the same year. In the islands he became regimental sergeant major. On the night of August 5, 1900, while the building where he was quartered was under fire, he fell down a flight of stone steps while attempting, in pajamas and cartridge belt, to get to the first floor to consult with his superior officer. He was an invalid in a Manila hospital and later at the Presidio, San Francisco. December 28, 1900, he was mustered out of service and sent to his home, 3031 Wabash avenue, Kansas City. Mr. Kings injuries from the assault include an injured spine and a severe shock to his legs, which were so long paralyzed. The right side of his face is cut and bruised and the attending physician, Dr. J. Park Neal, feared last night that blood poisoning might result from the jagged wound in his face. His ribs on both sides are injured, but the physician had not discovered if any were fractured because the injured man was in too great pain to permit a thorough examination. "It was reported to the police commissioners taht Gallagher's place on East Fourth street was open on Sunday and after closing h ours. For this reason the board refused to grant him a renewal of his license to operate that saloon." Mr. Jones was asked if he thought Gallagher a fit man to run a saloon or if he deemed him worthy of the privelge after having made such a brutal attack upon a man as he had done upon Albert King. Mr. Jones said he could not answer that question without going into the case to greater extent than he had already done. Commissioner Jones was then asked: "If any manmakes an attack on another while walking on the street while the victim is under the impression that there is no feeling of hostility between them; if the attack be sudden and unexpected and very brutal in its nature, should such a man be granted the privelege of owning and operating a saloon?" the Race as a Test. At the invitation of Elliott H. Jones, police commissioner, four men on motor cycles trailed the automobiles in the endurance race yesterday. All of the cycles made the trip successfully and beat Jones's machine back to Kansas City. The commissioner asked that the cycles be used on the run, because he has been appointed by the police board as a committee to investigate the feasibility of using motor cycles in the police department. Dr. A. Moses, C. Hanson, C. O. Hahn and L. C. Shellaberger, each mounted on a two wheeled machine, left Armour boulevard and the Paseo in a bunch yesterday morning about fifteen minutes after the last automobile was officially started. The party made the run to Lawrence without mishap. The freshly dragged roads proved slow going south from Lawrence and at Baldwin the leader was misdirected and led the party to Edgerton, which is a few miles off the course. They got back on the track and passed Jones at Waldo. They reached the city at 8:30 o'clock, with Moses a few yards in the lead. All of the cycles in the endurance test were Indians. Commissioner Jones, when he finally came steaming into the city, congratulated the four on their good run. for the Cop That Drinks. Clothes clean and freshly pressed, and shoes recently shined is the order which went forth from the police board yesterday to the policemen. Drill Sergeant Morrison will be instructed to see that this ruling is carried out. Mayor Crittenden made the suggestion, and the other two commissioners heartily indorsed his recommendation. "Nothing prejudices me so against an officer as for him to have grease s pots on his clothing, his trousers baggy at the knees and his shoes rusty looking," said the mayor. "A man who is slovenly in his personal appearance will be careless in his duty. I don't like to see it." "There's one excuse for the officers," said Commissioner Jones. "I think they are underpaid They ought to have at least $10 a month more. Then they could better afford to pay to have their clothes cleaned and pressed, and it could be required of them." "Yes, it's true that the patrolmen are underpaid," said Commissioner Gallagher. "But some of them are able to keep neat on their present salaries, and I don't see why the rest can't do equally as well. I see some dirty, greasy policemen that are a disgrace to the town." "We don't expect the police to by a new suit every few days or every season," said Commissioner Jones. "We never complain of them wearing old clothes. But it should be insisted upon that they be neat." The Third regiment armory will hereafter be used for the drills, instead of Convention hall. In the new place a course of neatness is expected to be added to the regular exercises by Sergeant Morrison, and each man will be required to learn by heart some good recipe for removing grease spots from clothing. "I want it generally understood that a policeman who drinks while on duty will be discharged and never taken back with my vote." "I don't like a policeman to drink, either on or off duty," said Commissioner Jones. "They have already made it a rule in St. Louis not to take back policemen who are found drinking on duty," said Commissioner Gallagher. "I think it is about time we were making the same rule here." "That man just ran against my bullet. I saw him before I fired and he was sixteen feet away, but he just ran into it." Thus did Detective Charles Lewis explain to the police board yesterday how it happened that a bullet fired by him at Frank Elliott, an escaping prisoner arrested on Christmas day on a robbery charge, went through the coat and overcoat of J. N. Downing, a lumberman living at 707 Oak street. Downing lodged a complaint against the detective December 31. "Well, he certaily must have been going some," commented Mayor Beardsley. "Better be a little more careful next time," said Commissioner Jones. Lewis was exonerated. The board at a previous meeting decided to pay Downing for his damaged coats. The police board decided yesterday that Kansas City is to have the best shooting police force in the country. That is to say, its police are to be the best marksmen with their revolvers. Orders were given for regular target practice by the force. D. C. Stone has been appointed instructor in shooting and inspection of firearms. The indoor target range at the Third regiment armory will be used. Regualr practice is to be required of all policemen, and records will be kept of their marksmanship. MOTOR CYCLES TO BE TESTED. Makes for the Police Squad. "I know less about motor cycles now than before I went to the Chicago motor car show," Elliot H. Jones said yesterday morning after his return. Mr. Jones, as a member of the board of police commissioners, attended the show to get pointers on motor cycles for use in the police department. "The exhibit contained so many different kinds of motor cycles as to bewilder me," said Mr. Jones. "I finally chose three makes and as soon as the 1908 models can be gotten by the dealers here we will arrange a practical test. A motor car will be pursued by a motor cyclist, who will endeavor to get near enough to read the numbers on the car and identify the occupants. When Ex-Chief of Police John Hayes and Police Commissioner Elliot H. Jones were called as witnesses before the grand jury yesterday it was rumored about the criminal court building that the jury was making an investigation with a view to taking action against the police commissioners for refusing to take any action toward the enforcement of Judge Wallace's Sunday closing instructions. Frank F. Rozzelle, a former police commissioner, was also called before the jury. Frank M. Lewis and A. L. Cooper, attorneys for the theater managers, were also summoned. It is expected that some action will be taken to close the theaters next Sunday, although no information could be gained from the witnesses who appeared before the jury yesterday. It is probable that the theater managers will be called today. Several witnesses have testimony in the case of the killing of Dan O'Keefe, which was alleged to have been done by Charles Merlino, a saloonkeeper. The subject of the testimony is to determine the charges to be placed against Merlino. TO CHASE FAST AUTO DRIVERS. Commissioner Jones has been delegated by the police board to secure bids on motor cycles with which to equip a squad of police to chase violators of the speed ordinances. The commissioner is a motorist himself, and suggested to the board that the average machine can "run clean away" and leave the sort of motor cycles sold here. He said the board would have to get specially built motor cycles, guaranteed to maintain a high speed. "It's getting too cold for a policeman to ride a motor cycle," said Commissioner Jones. "I favor a bicycle squad and feel that we must come to it, but I would propose that we postpone it until spring." C. F. Morse, writing from the stock yards, told the board yesterday that the best streets and boulevards of the city have become like railway rights-of-way. He says that rarely ever does a car go as slow as the maximum of twelve miles an hour. He said in the boulevards cars maintain a minimum of twenty miles, and that most of them travel about forty miles an hour. "In the south part of town, where the best streets have become speedways," said Mr. Morse, "the blocks are just one eight of a mile long, including one street width. At the maximum speed prescribed it should take a car 37.5 seconds to travel a block. This makes it easy for the police to time those who are daily violating the speed limit and endangering the public." Upon the petition of eleven actors, now filling engagements at the Orpheum and the Willis Wood theaters, Judge John C. Pollock of the United States circuit court issued a temporary order last evening at Topeka, Kas., restraining the board of police commissioners, Chief of Police Daniel Ahern, County Marshal Al Heslip and all their subordinates from arresting actors, actresses, members of any theater orchestra, and all persons performing services essential to producing an entertainment in any theater in Kansas City, Judge Pollock will be in Kansas City at 10 o'clock Friday morning to hear arguments in the federal court, for and against making the restraining order permanent. No mention was made of the managers of the houses, but it is thought that the restraining order was drawn to include them. For fear the order may not give them exemption from arrest a new move is being made, the attorneys securing affidavits from some of the most widely known business men of the city to the effect that Judge Wallace is prejudiced, and so incapable of giving the theater employes a fair trial. There is to be no conflict between the state and the United States courts. The restraining order is not directed against Judge Wallace, so that the criminal judge of Jackson county may continue his war upon the theaters, but he will not find any marshal nor police to effect the arrests which he may order. Although there are but eleven complaints in the federal case, they set up in their oration that they appear for the 200 or more professional actors now filling engagements in Kansas City, and for the several thousands of others similarly situated who will come to Kansas City to give entertainment before the close of the present session, which will be in July, 1908. The unique claim will be set up that the actors are akin to preachers, and that neither of them work. The theater orchestras are to be associated in the argument with church choirs. "In every particular and in every detail," said Attorney Frank M. Lowe, "we will be found on solid ground. There is to be an end to the attempt to close the theaters in Kansas City." The suit brought yesterday was filed by the following actors: B. C. Whitney, John Edwards, Lt. J. Carter and W. J. Jossey, of the Orpheum circuit; Benjamin Welch, Roger M. Inhoff, Charles ARnold, Harry Hastings, of the United States Amusement Company; Clifton Crawford, Arthur C. Ainston and William Leummel, playing at the Willis Wood. The defendants are Criminal Clerk A. E. Thomas, County Marshal Al Heslip, Police Comissioners Henry M. Beardsley, Andrew E. Gallagher and Elliot H. Jones, and their subordinates. NO ONE TO SERVE WARRANTS. Patrons of Sunday theatricals may occupy their usual seats today without fear of the performance being stopped by either the city or county officials. The theatrical managers yesterday secured a restraining order in the circuit court preventing County Marshal Al Heslip or his deputies from interfering with any of the performances, and Chief of Police Daniel Ahearn announced that, in the absence of instructions from the police board, he will not act. Judge W. H. Wallace of the criminal court, the head of the Sunday closing movement, said last night that he had secured no warrants against the theatrical managers, and that his court would not attempt to go counter to the restraining order issued by Judge Park and Goodrich of the circuit court against Marshal Heslip. Police commissioner Elliot H. Jones, upon whose concurrence with Mayor Beardsley the co-operation of the police with the county authorities in the Sunday closing crusade depended, yesterday left town to be gone over Sunday without issuing any instructions to Chief Ahearn. Police Commissioner Gallagher is also out of the city. "While I do not believe the circuit court would attempt to interfere with what action either my court, or the grand jury might take towards the closing of the theaters on Sunday, I have not had any warrants sworn out, and will not embarrass Marshal Heslip by asking him to close the amusement places without warrants," said Judge Wallace last night. "What either I or the grand jury may do during the next week I cannot say. But nothing will be done in regard to putting a stop to Sunday amusements tomorrow." Several thousands of people attend the theaters on Sundays, as well as weekdays, according to the petition filed in the circuit court by the theatrical managers, and these people would be deprived of a means of physical and mental benefit by the closing of the play houses on Sunday. "The marshal and his deputies have threatened to raid the theaters and prevent actors, actresses, and employes from performing their duties and to prevent the general public from attending the performances," says the petition. "It is therefore alleged that the plaintiffs' property, and the use of the same, will be interfered with and impaired as a continuous business; that the actors and actresses' compensation for their services will be reduced, and they will also commit a breach of their contracts. It is asked that the marshal and his deputies be restrained and enjoined from doing any act which will in any wise interfere with or obstruct the plaintiffs' business, or from closing the theaters Sunday, October 13, or subsequent Sundays. Police Commissioner E. H. Jones, it was reported at his home last night, has gone to Jefferson City. Commissioner A. E. Gallagher several days ago went on a hunting trip, and has not yet returned. "The theaters will run tomorrow as usual, and we intend that they shall continue to do so every Sunday thereafter," said Martin Lehman, manager of the Orpheum theater, last night. "The managers intend to fight the case to the last." The following are the theaters affected by the restraining order: Willis Wood, Orpheum, Grand Shubert, Auditorium, Gilliss, Century, and Majestic. In its memorandum on the granting of the restraining order, the court said that the alleged contemplated action of the county marshal in closing the theaters on Sunday would be such a radical departure form the existing order of things that it seemed best to have a hearing of the merits of the case before the marshal be permitted to proceed. FIRST OF ITS KIND HERE. "I am sorry there are no more horses and dogs present. I would like to ask them all to step up and have a drink with us." Mr. Faxon was more generous than he thought, as he learned at the close of the exercises, when he and the other speakers and the audience rushed over to the fountain to get a drink. There are no cups on the fountain. It is strictly a place for birds, and four-footed beasts. President E. R. Weeks, of the Kansas City Humane Society, who wore a Panama hat, essayed to drink out of the rim of his headgear, mountain brook fashion, but most of the water ran down his shirt front. Mr. Faxon, Police Commissioner Elliot H. Jones, Mrs. L. O. Middleton and others looked on and declined to try to use the hat which Mr. Weeks proffered them. The humans held a meeting around the fountain and argued the question of having cups chained there, but decided adversely. "During a busy and hot work day," John Simmons, secretary of the Teamsters' union, said, "the teams line up from all directions awaiting their turns at the fountain. There is no chance for a man to get a drink. Besides, if there were cups, children who tried to drink might be trampled by the horses which rush to the fountain." Nearly every department of city life was represented in the dedication exercises. E. R. Weeks was chariman, Hale H. Cook appeared for the school children, Mrs. L. O. Middleton for the T. T. U. F. M. Furgason carried a Judge Jules E. Guinotte proxy, George Hoffman spoke for the city hall, Father Dalton for the church people, Harry Walmsley apeared for the birds and Frank Faxon for "Old Dobbin." No one had a word to say in condemnation of any bird or beast. The speakers tried to outdo each other in praise. Mr. Faxon said that a horse "was always faithful and kind," and Mr. Walmsley declared that the birds are symbols of the heavenly life." But Mr. Furgason, reading Judge Guinotte's speech, went then all one better when he quoted George Elliot as saying: "The more I associate with men, the more I like dogs." In calling attention to the fact that the fountain dedicated yesterday was the first permanent one in the city, Mrs. Middleton recited the history of attempts made by various charities in past years to erect public drinking fountains. The most successful of these schemes was the setting in place of twelve ice water casks on downtown corners by the W. C. T. U. many years ago. The beautiful piece of granite dedicated yesterday afternoon, which Thomas Wight, secretary of the Kansas City art commission, described as "a permanent bit of art and a forerunner of a new era in municipal life," was presented by the National Humane Alliance of New York. The purchase price came from a fund bequeathed by the late Herman Lee Ensign of New York, whose name is on a bronze plate on one side of the fountain. The Kansas City Humane Society and the city council were among those most instrumental in securing the gift for this city. The society hopes that other fountains may be erected on busy corners through gifts by local philanthropists. Continuing Governor Folk's policy of removing "political enemies" from the police department, Captain Weber was yesterday dropped from the force by Commissioners Gallagher and Jones, Mayor Beardsley voted to recommission the captain. All other captains were recommissioned. Whitwash spread over the actions of Patrolman Athur who, it was charged, attempted to draw a revolver on former Commissioner Rozzelle at Wednesday's board meeting. Lieutenant Hammil, who refused to return Patrolman Arthur's club and gun after the overt act until ordered to do so by Acting Chief Ahern, was transferred from headquarters to the Walnut street station. Lieutenant Hammil also took an important part in impeaching Arthur's testimony before the board regarding Arthur's vitriolic attack on Chief Hayes and former Commissioner Rozzelle in police headquarters. Lieutenant Walter Whitsett, who has been mentioned as a possibility for chief, and who it is said is friendly to the Kemper forces, is given Hammil's place at headquarters. Many believe this is the first step toward making Whitsett chief. The transfers of Lieutenants Hammil and Whitsett were upon the resolution of Commissioner Gallagher "for the good of the service." Commissioner Jones, in his first resolution, moved to reappoint James Vincil to serve three more years as secretary to the police board. Captain William E. Weber has been on the police force since he was appointed jailer November 4, 1889. He was appointed a probationary patrolman the following day and May 30, 1890, was made a patrolman. He walked a beat for five years and won his promotion to sergeant by an act of bravery. In a fight in Grand avenue, a liquor crazed salesman rushed at an intended victim with a butcher knife. Captain Weber coolly shot the butcher knife from the hand of the would-be slayer. His promotion to sergeant came on September 4, 1895. He was made a lieutenant of police October 1, of the same year, and was recommissioned after serving three years. 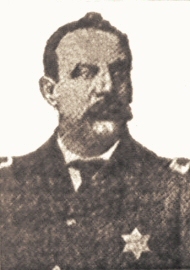 To take advantage of the raise in salary, Lieutenant Weber resigned and under the Cleary law, August 15, 1900, was at once appointed to his former rank with the increased pay allowed a law just passed. August 29, 1901, Lieutenant Weber was commissioned captain. "I Won't Answer Any More Questions,"
Elliot H. Jones, the new police commissioner, after a day and a half of public life, has taken to the woods. There he hopes to find dense foliage and a deep shade. When The Journal attempted to interview Mr. Jones in the second chapter of the police commissioner's catechism Mr. Jones declined to answer the question. "What motives prompted you to return the revolver and club to Patrolman Arthur?" he was asked. "I don't want to discuss the Arthur business at all," he said. "Do you believe that Arthur was threatening the life of Mr. Rozelle when he made an attempt to pull his revolver?" was the second question. "Do you think it is 'for the good of the service' to have such men as Arthur on the police force?" was number three. "I refuse to answer any more questions. NEW CHARGE OF GRAFT MADE. Governor Folk's attempt to turn the police department into a political machine came very near to resulting in bloodshed yesterday afternoon. Prompt action on the part of ex-Chief Hayes in hustling Patrolman Arthur out of the board room probably averted a tragedy. The lie had passed between ex-Commissioner Rozzelle and Arthur, when the latter suddenly dropped his club and reached for his "gun." The board room was filled with men, many Shannon "rabbits" being in the throng. Chief Hayes, who did not know he had been deposed, grabbed Arthur. "Leave that man alone!" shouted Commissioner Gallagher. "You are no longer a police officer." But Hayes, mindful of his duty, hustled Arthur out of the room. It was a day fraught with numerous incidents, all tending to show that Folk and Shannon are building an air-tight police machine out of a police department thoroughly demoralized by a "reform" governor. In the first place Folk's new commissioner voted to supplant Hayes with Daniel Ahern without hearing any evidence. To a Journal reporter last night he admitted that Commissioner Gallagher had shown him the resolution deposing Hayes in the hallway a few moments before the board went into session. Mayor Beardsley voted against the resolution. It was shown that Patrolman Arthur, Mr. Gallagher's chief witness, misstated fact after fact on the witness stand, witnesses and official records disproving the assertions on which Gallagher and Folk hoped to prove Hayes unfit for chief. Chief Hayes testified that the men on the force were juggled by Gallagher for political reasons. Officers who were alert in closing saloons on Sunday were moved to other beats, on Gallagher's order, the chief said. He gave a list of the men Gallagher had ordered changed to other beats. Gallagher did not deny the chief's statements. In the lobby of Central police station Patrolman Arthur became so abusive of Rozzelle and Hayes -- who were in an upstairs room -- that Lieutenant Hammil had to order him from the room. Chief Hayes made the charge that graft existed in the police department to the extent that a son of Commissioner Gallagher had written insurance for the keepers of North end saloons and resorts on the strength of being in position to call the police down on them if they refused to give him business. Gallagher denied the assertion and said Hayes lied. Former Detective Bert Brannon leaped into the room and called Gallagher a ----- ----- liar and said he could prove that young Gallagher had done all Hayes charged against him. Brannon was hustled out of the room. No subpoena was issued for him to delve deeper into the charges. A more disorderly meeting of a Kansas City police board probably was never held. The one man responsible for yesterday's disgraceful scenes is Joseph W. Folk, the reformer. He has spread the seeds of disruption among the Kansas City police in his efforts to further his candidacy for the senate until today the force is one of the most thoroughly disorganized in the country. The first row at the police board meeting yesterday was precipitated when Lieutenant H. W. Hammil, in command at police headquarters under Captain Weber, ordered Patrolman Arthur out of the station. Arthur, according to several witnesses whose testimony was afterward used, became abusive and said uncomplimentary things of former Commissioner Rozzelle and Chief Hayes. He called Rozzelle and unprintable name, and Hammil, according to his own statement before the board, ordered him to "shut up." Lieutenant Hammil was called before the board by Mr. Kimbrell and he detailed the row with Arthur at length. "Arthur said Chief Hayes had dogged him around and was responsible for his reduction in rank and that he will holler on some one if hey don't stay off him." Arthur, according to his custom, interrupted Lieutenant Hammil. He charged that Hammil did most of the talking and taunted him with the mark that Hammil had said: "There's liable to be a hell of a lot of changes around here today." "Hammil told me three months ago," continued Arthur, "that someone has been jobbing me. He said he could very easily use me down town and that he was sorry he had to send me to the suburbs. He said he needed men at the theaters and that over in Broadway thieves were kicking in front doors and $1,000 robberies were of nightly occurrence, but that the chief had given strict orders that I be kept on duty at the theater or sent to an unimportant beat. "Hammil said, 'Arthur, there is no use of your putting your head into the halter. This fellow Rozzelle has lots of friends and they are going to get you.' "
This statement was made under oath, as were all of the other statements made by Arthur during the day. Lieutenant Hammil was also under oath. He denied positively ever having talked over such matters with Arthur and said he had not spoken to Arthur in three months except in the line of duty. Arthur declared that chief Hayes leaves the station at 3 or 4 o'clock and that Hammil then directs him and assigns his duty. Chief Hayes made Arthur take back his word as soon as uttered and Arthur supplemented his statement by saying that sometimes the chief remains on duty until 5:30 o'clock in the evening. A. C. Durham, an attorney, who at one time represented Arthur when the latter was preparing charges against Chief Hayes, testified that Arthur told him if they didn't show reason for his reduction in the department he would expose the misconduct in office of Chief Hayes. Durham said he was later dismissed and the charges dropped. He did not know why. By this time Lieutenant Hammil had found two witnesses to his row with Arthur and they were sworn. They were Sergeant Eubank and Patrolman Lukehart. Neither heard Hammil say "there might be a hell of a lot of changes in the department," as Arthur had charged, but each testified that he heard Arthur abuse Rozzelle and Hayes and heard annd saw Hammil eject him and order him to "keep his mouth shut." Arthur boldly stated to the board that Lukehart was testifying to a lie. He stated that Lukehart is sore at him over a judgment for $40, which the court ordered Lukehart to pay him. Secretary Vincil quieted Arthur by stating that the money had long since been paid to him by Lukehart but that Arthur had refused to accept it. It looked as though a tragedy were about to be enacted in the police board room near the close of the hearing yesterday. Harry A. Arthur had testified against Chief Hayes, but his evidence was discredited by other witnesses and the records. Arthur precipitated a row that threw the meeting into uproar. Commissioner Rozzelle was on the witness stand at the time. Arthur was disarmed by Chief John Hayes and taken from the board room by patrolmen. It was the second time the services of patrolmen were needed to clear the room during yesterday's session of the police board's investigation of the department. County Prosecutor Kimbrell, acting as attorney for Chief Hayes, had drawn his net of impeachment tightly about Arthur as the investigation proceeded and lacked by the testimony of one witness to discredit the patrolman's denial that he had ever threatened his chief. This witness was Frank F. Rozelle, the police commissioner removed by Governor Folk by wire on the eve of the recommissioning of John Hayes as chief of police. In combating the charges brought by Arthur against Hayes, Mr. Kimbrell, in cross examination, secured Arthur's statement that he had never in his life mentioned the name of Chief Hayes to Commissioner Rozzelle and that he had never called the commissioner "crooked." Contrary to the expectations of Patrolman Arthur and Mr. Gallagher, the former commissioner promptly took the witness stand when called by Mr. Kimbrell. Mayor Beardsley explained that Mr. Rozzelle need not give his testimony until the notes of the day's investigation had been transcribed that he might know just what had been said about him by witnesses. "But I am willing to answer any questions," said Mr. Rozzelle, and Kimbrell's examination proceeded. Harry Arthur was an attentive auditor while the former commissioner was on the stand. He had previously broken into the testimony of other witnesses and his actions throughout the afternoon had been countenanced by Chairman Beardsley who knew the other two commissioners were eager to hear all Arthur had to say. "Mr. Arthur has testified that he never discussed Chief Hayes with you repeatedly here today," Mr. Kimbrell said to Mr. Rozzelle. "Will you tell the board of any conversation you may have had with Arthur about the chief?" "Arthur came to me to see about getting a promotion to his former rank," replied Mr. Rozzelle. "He told me if I did not vote for his promotion he would go to Commissioner Gallagher with charges against Chief Hayes. He said the chief had been responsible for his reduction in rank, and that he would get even through Mr. Gallagher unless I voted for his reinstatement." "I never made such a statement in my life," cried Arthur. "You told me you had heard it, and that you did not believe a word of it." "Be careful," admonished Mr. Rozzelle, never rising from his seat. "That statement is a falsehood." Immediately the room was in an uproar. Harry Arthur reached for his club and arose. He was nervous. His eyes protruded and his hands shook. He dropped the club to the floor. Then he reached for his pistol pocket. Chief of Police Hayes was the first man to realize his duty. He was sitting by his attorney at the other end of the long table. His eye had been quicker than the hand of the angry patrolman. In an instant he had pinioned the arms of the belligerent patrolman and was searching for the pistol. A dozen men started to assist him. Police Commissioner Gallagher arose and demanded that Chief Hayes release Arthur. His command could be heard throughout the board room. "That man is not an officer. Take him off!" yelled Gallagher. "Let Arthur alone. You are only a citizen. We have a new chief of police downstairs. Call him to keep order -- if such a course is necessary." Chief Hayes had disarmed Arthur, who fought his captors and shouted to Commissioner Gallagher: "Well, what do you think of that. I'm not trying to shoot anybody, Mr. Gallagher." Didn't Know He Was Deposed. The chief's work was done and he allowed patrolmen, who appeared to be in good standing with the board, t remove Arthur from the room. Then he turned inquiringly toward the commissioners. He had heard for the first time that he had been succeeded in office. The very first action of the board had been to appoint his successor, but the matter was done in an undertone and the chief had not been informed. Even his attorney, Mr. Kimbrell, was dumbfounded. He asked the meaning of Gallagher's statement. Chairman Beardsley called Chief Hayes to the table, and, for the first time, the head of the Kansas City police department was told that he is no longer a police officer. "I will have to ask for your emblem of authority," said Mr. Beardsley. Chief Hayes unpinned the gold badge from his left breast and handed it to the mayor. "Your successor was named by resolution introduced by Mr. Gallagher, Commissioner Jones concurring," said the mayor. "I guess it is customary to ask for the badge. I really don't know." Since Chief Hayes has been without a commission since May 4 no action of the board was necessary to remove him from office. When the board met yesterday afternoon Chief Hayes did not last five minutes. But a half a dozen sentences were spoken. Elliot H. Jones, the new commissioner, entered the room and Chairman Beardsley pointed out his seat to him. "I have two resolutions to introduce," said Commissioner Gallagher. The room was still noisy. Persons who were to appear as witnesses before the board were entering the room and searching for seats. The first resolution, naming Inspector Daniel Ahearn as temporary chief of police and Lieutenant Charles Ryan as inspector of detectives, was passed by him to Mr. Beardsley. The mayor read the resolution and passed to silently to Commissioner Jones, who gave it to the secretary of the board without any notice whatever. "Do you think he is the proper man for the place?" asked the mayor of Mr. Gallagher. "He is the ranking officer," volunteered Commissioner Jones, who had not looked at the resolution but apparently was familiar with its contents. "I move its adoption," said Mr. Gallagher. "I vote aye," echoed Commissioner Jones. Mayor Beardsley was silent. He appeared in a deep study. When he was sufficiently recovered to speak, he said: "I am going to vote against the resolution. I will make a minute of my vote and hand it to the secretary. I want it to get in the record." None of this transaction could be heard a dozen feet from the members of the board and Chief Hayes and his attorney, Mr. Kimbrell, whose seats were at one end of the table, remained ignorant of the resolution until after the meeting and the fight which called for the chief's star. As Commissioner Gallagher protested against the action of Chief Hayes in disarming Patrolman Arthur, Mayor Beardsley jumped to his feet. "The police board is in control of the room," he said. "Chief Hayes, disarm that man." The mayor did not see the necessity of sending down stairs for the new chief of police to disarm a man who was apparently in the act of attempting to do violence to the witness. The lie had been passed earlier in the session between Commissioner Gallagher and Chief Hayes and patrolmen had been called to clear the room. Gallagher had taunted Chief Hayes by producing in evidence a letter from Chief Hayes to Sergeant Caskey about changing the beat of a patrolman. The chief had stated on the stand that if he had written the letter he did not recall the language. Gallagher insinuated that the chief was lying several times and finally, referring to various passages in the Arthur testimony, said: "You see how easy it is to impeach the testimony of a witness. I had made you out a liar already. Be careful of the statements you make before this board hereafter." "If I wrote the letter I did it to shield you," rejoined Hayes, "for you had caused the patrolman to be sent back to his former beat after I removed him because he had been gambling." Chief Hayes was angry as he stepped forward to the table and faced the board. "I'm tired of exposing the things forced upon my by Mr. Gallagher and then having my word doubted when I probably wrote a letter saying the changing of Patrolman Thomas Park's beat was a mistake merely to shield the commissioner. "I wish now to make a further statement. It is an apology to Mayor Beardsley for a statement I recently made. I know the mayor nor Mr. Rozzelle ever thought I was referring to either of them, but I wish now to tell the whole truth of my statement. "I stated early in this investigation that if there is any graft in the department it is higher up than me. That statement was directed at Commissioner Gallagher. I am in a position to prove that he is guilty, too. Mr. Gallagher's son is using his father's name and office to secure business for his father's firm. He goes about amongst the disorderly houses, saloons and resorts in the North end soliciting fire insurance policies. He tells proprietors that his father is a police commissioner and that they must "come through" with their insurance business or trouble will result in their licenses." "Any man who makes that statement is a liar," shouted Commissioner Gallagher. "I have the proofs here," suggested Chief Hayes. "You are a liar ---" began Gallagher. At this point in the heated proceedings Bert Brannon, a former detective, burst through the crowd and came inside the railing. Shaking his fist at Commissioner Gallagher, he shouted angrily: "I made that statement to Chief Hayes of the graft you and your sons have built up out of your office. I know it's true. The man who denies it is a --- damned liar." Mayor Beardsley, always the peacemaker and protector of lives and the pursuit of liberties in the board room, sprung to his feet and summoned patrolmen to remove Brannon. As Brannon made his charge a man near the entrance chimed in: "I am a saloon man and Gallagher's son held me up for insurance the same way." He said he did not know Brannon and asked a neighbor his identity.